Here is another shot for your site. Fish caught by Suso Varela, who used to guide for Maria Behety Lodge TDF. 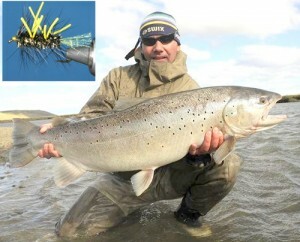 Caught on 12/16/2008 in Tierra del Fuegos Rio Grande (El Cartel Pool) Argentina. This 27 lb Sea Run was caught using Pepe Flies SGN Black Gold Fly tied on a Daiichi 1720 Size #6, using all Hareline Dubbin Materials. Black Hackle, Speckled Chenille Black and Gold, White Rubber legs and Yellow Krystal Flash.